DESCRIPTION: Boar is a large or medium-sized animals. Adult boars males reach an average height of 103 cm at the withers, the height ranges from 93 to 120 cm. The females at the withers 75 cm on average, but with a difference of 61 to 96 cm. In large specimens of wild boar head length can reach 60 cm. Bust in adult boars usually about 145 cm. Muzzle no warty growths of the skin. Skull at moderately developed boar in length, compared with other types. 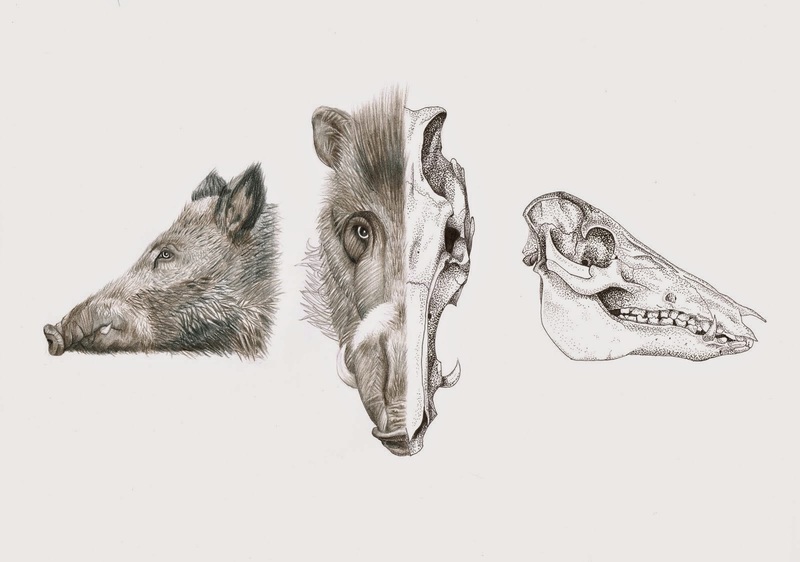 In smaller species the length of the skull is from 345 to 375 mm, larger species have a skull more than 400 mm, and males and does have a skull of 490 mm. Some individual parts of the skull (the proportions and shape of the lacrimal bone, the character fronto-facial profile, the relative length of the front part) differ in their subspecies. The lower teeth in adults is 6 - 10 cm.